When I think of a white lion, I think of Kimba the White Lion, a fun Japanese cartoon of the last decade about a lion cub with more courage than all the kings of jungle. Even though this cartoon was based on white lion, there is actually some merit behind this story which is where White Lion comes into the picture. For a lion to be born white, there is some powerful African spirituality behind this occurrence. 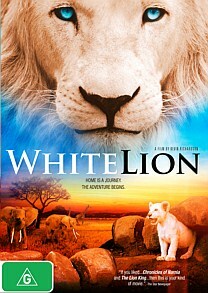 With that said, White Lion is not a documentary but a rather wholesome family movie thanks to director Michael Swan with writers writers Janet Van Eeden and Ivan Milborrow. At times, White Lion seems like an amalgam of Milo & Otis meets Meerkat Manor in its presentation. The star of White Lion is Letsatsi which revolves around his journey as an outcast due to his colour as it is retold by an African story teller (John Kani) as he recounts the tale of Letsatsi. Joining our friendly storyteller is Gisani (Thabo Malema), a tribesman who has dedicated part of his life to protect the lion until the cub becomes the king of the jungle. This is Letsatsi's story as we are taken on a journey of ups and downs revolving this cute little white lion. Given that the White Lion is a family movie, there are a few scary bits for younger children and considering that we are dealing with meat eaters and lions, one really should expect this such as the lions hunting other animals. Even though the story feels like a Saturday Disney movie with some really over the top acting, the visuals of the movie are quite stunning, especially some of the amazing footage of these animals and cinematography of Africa. It's definitely a feel good movie and is great that some companies are still making stories for the family and White Lion is one of these movies but it does play the safe card a little.